Fairbanks, Alaska is a beautiful city nestled in the interior region of Alaska with a population of over 32,000 people. What this means is that you’re able to experience the Alaskan way of life but can still have all the amenities of living in a city. Fairbanks is also steeped in a rich cultural history of exploration, and the gold rush. When you visit Fairbanks and book a Fairbanks City Tour with us you can expect to experience the best of both worlds. The tour is meant to give you a fun and educational experience you’ll never forget while learning about Fairbanks’ history, Alaskan Craftsmanship, and how to keep busy during those bitter winters with some different winter activities. The day starts early with an 8am pickup at your accommodations, and a ride over to the Fairbanks Visitors Center. Here we’ll congregate and start a tour of the Morris Thompson Cultural Center. The tour is guided and packed full of interesting facts and stories about how Fairbank’s came to be and started off as a trading post before becoming home to a slew of prospectors looking to strike it rich. You’ll be treated to exhibits such as what it’s like living in interior Alaska, “How We Live: The People and the Land”. Check out the life size dioramas that depict living in interior Alaska during all the different seasons. After you’ve visited the Fairbanks Visitor Center you’ll then be invited to the historical Pioneer Park. This 44 acre park was originally named Alaskaland and was built in 1967 to be a tourist attraction that showcased Alaska exhibits and way of life. Now known as Pioneer Park it serves to continue on the tradition of showcasing Alaskan way of life with 3 museums, a 40 foot antique carousel and an old-time saloon just to name a few. Walk around the park and take fun pictures in front of the Gold Rush Town and take a step back in time. The next couple of stops on the tour will be focused on showcasing Alaskan craftsmanship. You’ll head over to “The Great Alaskan Bowl Company” where you can see the meticulous craftsmanship that goes into every bowl. This attention to detail is something that Alaskans take great pride in. Of course, you’ll then want to hit up the gift shop and take home a couple authentic Alaskan Birch Bowls which are hand-made from locally sourced materials. The final stop on the tour is to see the Downtown Ice Museum. This is something you definitely won’t want to miss! Check out a Fairbanks winter tradition during the warmth of the summer. Inside you’ll see gorgeous crystal clear ice sculptures of all shapes and sizes. Expect to see ice sculptures of all styles and designs made by local artists. 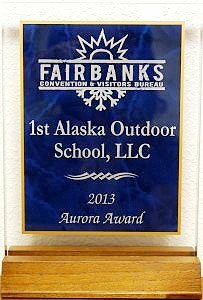 Give us a call now to book your Fairbanks City Tour. Don’t wait because seating is limited and fills up quickly. (907) –590-5900.